Herb Simon's talk on "Forecastig the Future or Shaping it?" video and paper (CMU, October 2000), and clip on robot soccer (which I presented in my Presidential Address at AAAI'14, July 30, 2014). Also please see below the PhD theses of my students. CORAL - My research group on intelligent robots that Cooperate, Observe, Reason, Act, and Learn. Our CMDragons team is the 2015 RoboCup Small Size World Champion! See the news and the video highlights of ALL the games (6-0, 10-0, 10-0, 15-0, 2-0, 5-0). Learn more. Watch CoBot videos. See the publications. 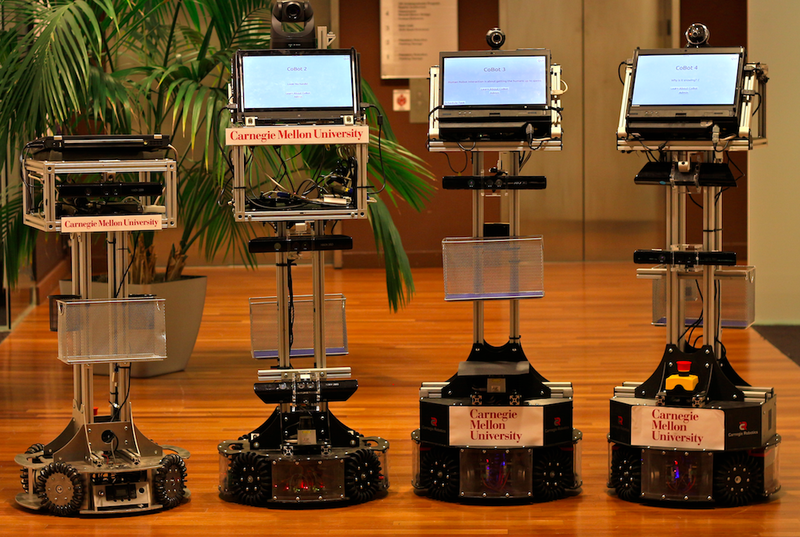 We research on effective autonomous indoor mobile service robots. We aim at contributing to a multi-robot, multi-human symbiotic relationship, in which robots and humans coordinate and cooperate as a function of their limitations and strengths. The robot hardware for all CoBots was designed and built by Mike Licitra. The research has led to the PhD theses of my students Joydeep Biswas, Stephanie Rosenthal, and Brian Coltin. Our CORAL/Robot Soccer page for research and news. RoboCup'17 will take place in Nagoya, Japan..
See a description of the V-Unit and send me email if you are interested in taking a V-Unit. The V-Unit is linked to the Technology Bridge World effort. Vittorio Perera, Ph.D. Computer Science, August 2018, Amazon. Thesis: Language-Based Bidirectional Human and Robot Interaction Learning for Mobile Service Robots. Danny Zhu, Ph.D. Computer Science, December 2017, Determined AI. Thesis: Augmented Reality Visualization for Autonomous Robots. Juan Pablo Mendoza, Ph.D. Robotics, August 2017, Waymo. Thesis: Regions of Inaccurate Modeling for Robot Anomaly Detection and Model Correction. Richard Wang, Ph.D. Computer Science, May 2016, ABB. Thesis: Collecting, Analyzing, and Using Fine-Grain Sensor Data with Mobile Platforms. Junyun Tay, Ph.D. Mechanical Engineering, May 2016, dual degree, CMU ME/NTU CoE Program, Bossa Nova Robotics. Thesis: Autonomous Animation of Humanoid Robots. 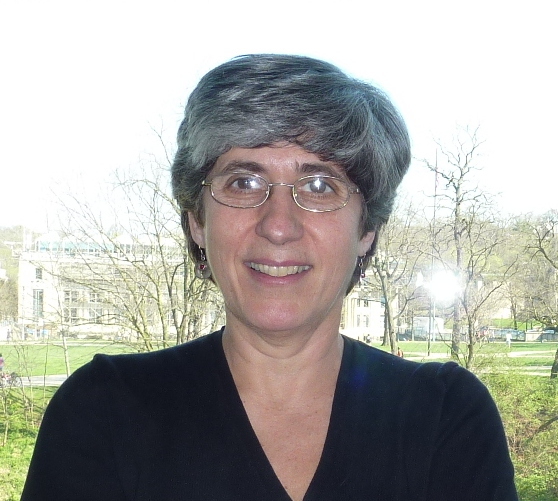 Susana Brandao, Ph.D. Electrical and Computer Engineering, August 2015, dual degree, CMU-Portugal Program, SISCOG. Thesis: Heat Based Descriptors for Multiple 3D View Object Recognition. Mehdi Samadi, Ph.D. Computer Science, August 2015, Co-founder Solvvy. Thesis: Facts and Reasons: Web Information Querying to Support Agents and Human Decision Making. Joydeep Biswas, Ph.D. Robotics, December 2014, Assistant Professor, University of Massachusetts, Amherst. Thesis: Vector Map-Based, Non-Markov Localization for Long-Term Deployment of Autonomous Mobile Robots. 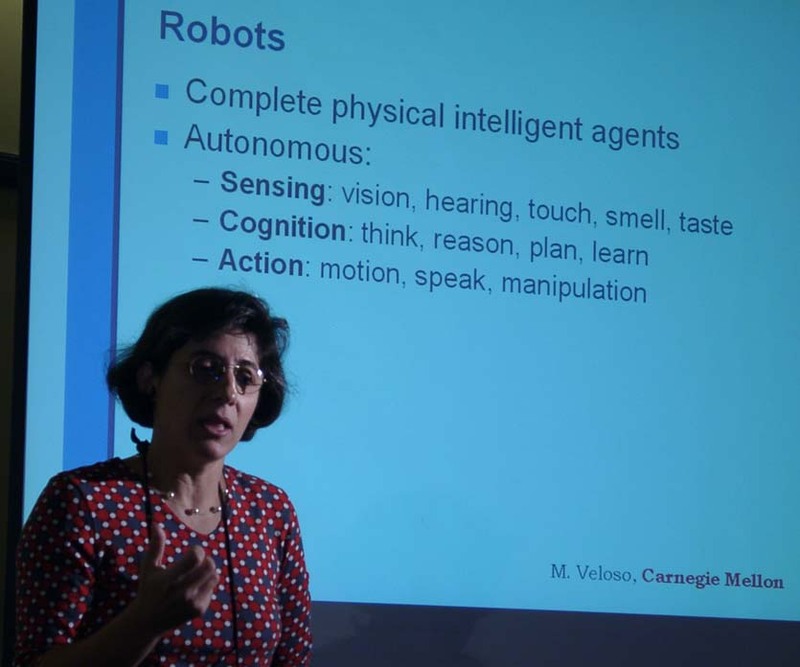 Tekin Mericli, Ph.D. Computer Science, August 2014, Bogazici University, Turkey, Senior Robotics Engineer, CMU/NREC. Brian Coltin, Ph.D. Robotics, May 2014. NASA Ames. Thesis: Multi-agent Pickup and Delivery Planning with Transfers. Prashant Reddy, Ph.D. Machine Learning, December 2013. Nest, Google. Thesis: Semi-Cooperative Learning for Smart Grid Agents. Felipe Trevizan, Ph.D. Machine Learning, August 2013. Researcher, NICTA, and Adjunct, Australian National University. Somchaya Liemhetcharat, Ph.D. Robotics, August 2013. Uber, Pittsburgh/Singapore. Thesis: Representation, Planning, and Learning of Dynamic Ad Hoc Robot Teams. Stephanie L. Rosenthal, Ph.D. Computer Science, May 2012. Researcher, SEI, Pittsburgh. Cetin Mericli, Ph.D. Computer Science, May 2011, Bogazici University, Turkey, Research Scientist, CMU, NREC. Thesis: Multi-Resolution Model plus Correction Paradigm for Task and Skill Refinement on Autonomous Robots. Sarah Aboutalib, Ph.D. Computer Science, December 2010. Thesis: Multiple-Cue Object Recognition for Interactionable Objects and Videos. Stefan Zickler, Ph.D. Computer Science, May 2010, iRobot, MA. Sonia Chernova, Ph.D. Computer Science, May 2009, Assistant Professor, Georgia Institute of Technology. Elisabeth Crawford, Ph.D. Computer Science, May 2009, Birchbox, NY. Colin McMillen, Ph.D. Computer Science, May 2009, Google, Cambridge, MA. Brenna Argall, Ph.D. Robotics, May 2009, Assistant Professor, Northwestern University. Yang Gu, Ph.D. Computer Science, August 2008, Google, Mountain View, CA. Douglas Vail, Ph.D. Computer Science, May 2008, Google, Pittsburgh. Elly Winner, Ph.D. Computer Science, May 2008. Maayan Roth, Ph.D. Robotics, September 2007, Flatiron, New York, NY. James Bruce, Ph.D. Computer Science, December 2006, Google, Mountain View, CA. Scott Lenser, Ph.D. Computer Science, August 2005, iRobot, MA. Patrick Riley, Ph.D. Computer Science, March 2005, Google, Mountain View, CA. Rune Jensen, Ph.D. Computer Science, June 2003, Associate Professor at IT University of Copenhagen, Denmark. Thesis: Efficient BDD-Based Planning for Non-Deterministic, Fault-Tolerant, and Adversarial Domains (co-advised with Randy Bryant). Michael Bowling, Ph.D. Computer Science, May 2003, Professor, University of Alberta, Canada. William Uther, Ph.D. Computer Science, August 2002, Researcher, National ICT, Sydney, Australia. Belinda Thom, Ph.D. Computer Science, December 2001. Bryan Singer, Ph.D. Computer Science, December 2001, NSA, Washington, DC. Peter Stone, Ph.D. Computer Science, December 1998, Professor, University of Texas, Austin. Astro Teller, Ph.D. Computer Science, December 1998, Google, Mountain View, CA. Karen Haigh, Ph.D. Computer Science, May 1998, BBN. Yury Smirnov, Ph.D. Computer Science, August 1997, CEO and founder of Akonite, Inc., CA. Ashwin Khadke, M.Sc. Robotics May 2018, CMU RI PhD student. Sai Prabhakar, M.Sc. Robotics August 2017, Disney Research. Sandeep Konam, M.Sc. Robotics May 2016, UPMC. Kim Baraka, M.Sc. Robotics, May 2016, CMU-Portugal RI PhD student. Steven Klee, M.Sc. Computer Science, August 2015, Google. Grant Strimel, M.Sc. Computer Science, August 2014, Amazon, CMU CSD PhD student. Fatma Faruq, M.Sc. Robotics, May 2014, Researcher at University in Pakistan. Joydeep Biswas, M.Sc. Robotics, December 2009, CMU RI PhD student. Juan Fasola, M.Sc. Computer Science, August 2007, USC PhD student. Dinesh Govindaraju, M.Sc. Robotics, 2006. John Gavin, M.Sc. Computer Science, 2005, Microsoft Research. Francesco Tamburrino, M.Sc. Robotics, 2004. Paul Carpenter, M.Sc. Computer Science, 2003, ICT, LA. Kwun Han, 1998, Gigapixel, Inc., Palo Alto, CA. Fall 2016 - 15-887, Planning, Execution, and Learning, co-teaching with Maxim Likhachev, MW 1:30-2:50pm, NSH 3002. Spring 2016 - CMRoboBits: AI and Robots for Daily-Life Problems. Project-based course. GHC 3201, 1:30-2:50pm. Project Milestones and Demonstrations: March 2, April 6, May 4, 2016. Fall 2015 - 15-381, Artificial Intelligence, co-teaching with Zico Kolter. Spring 2015 - 15-780, Graduate Artificial Intelligence, co-teaching with Emma Brunskill. Spring 2013 - 15-780, Graduate AI, co-teaching with Tuomas Sandholm, MW 10:30am-noon, GHC 4303. Fall 2012 - 15-491, CMRoboBits - Creating Intelligent Humanoid and Service Mobile Robots, Project-Based Course, MW 3:00-4:30pm, GHC 3201. Fall 2012 - 15-887, Planning, Execution, and Learning, co-teaching with Reid Simmons, MW 1:30-3:00pm, GHC 4303. Spring 2012 - 15-895B - Artificial Intelligence for Sustainability and Health Care - Reading, Project-Based Course - M, W, 5-6:20pm, GHC 4303, co-teaching with Emma Brunskill. Fall 2011 - 15-381, Introduction to Artificial Intelligence, co-teaching with Drew Bagnell and Emma Brunskill. RoboCup-2007, the 11th International RoboCup Competitions and Symposium, July 1- July 10, Atlanta, USA. Our CMDragons'07 team for the small-size league is world champion. Our CMPack'07 team for the AIBO league came in 3rd place. RoboCup-2006, the 10th International RoboCup Competitions and Symposium, Bremen, Germany. Our CMDragons'06 team for the small-size league is world champion. RoboCup-2005, the 9th International RoboCup Competitions and Symposium, July 13-19, 2005, Osaka, Japan. 2005 RoboCup USOpen, May 7-10, 2005, Georgia Tech in Atlanta. RoboCup-2004, the 8th International RoboCup Competitions and Symposium, June 27 - July 5, 2004, Lisbon, Portugal. Our CMPack'04 team for the AIBO league is champion. Our CMOwl'04 team for the coach simulation league is champion. Our CMLoki'04 team for the soccer simulation league came in 3rd place. The First RoboCup American Open took place April 30 - May 4, 2003, at Carnegie Mellon. RoboCup-2003 was be held in Padua, Italy, July 1-12, 2003. RoboCup-2002 was held in Fukuoka, Japan, June 17-26, 2002. We entered two robot teams: our small-size robot team CMDragons'02, and our Sony legged robot team CMPack'02. We won first place in the RoboCup-2002 Sony legged league! :-) We are now World Champions. Some pictures, and some more pictures. 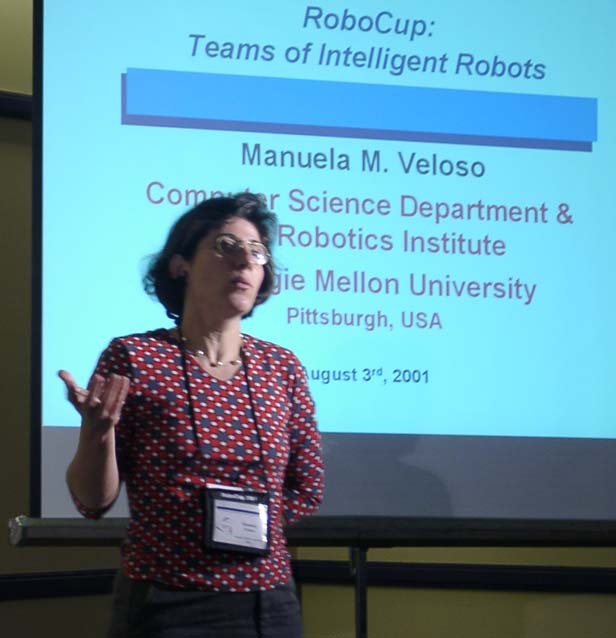 I was General Chair for RoboCup-2001, held for the first time in the USA - Check the results! I was on sabbatical leave for 2013-14, at NYU, at the Center for Urban Science and Progress, CUSP, to learn about real data and real decision making in real cities. Radcliffe Institute for Advanced Study, Harvard University. I was the Program Chair for IJCAI-07, held January 6-12, 2007, in Hyderabad, India. It was a fantastic event! Thanks to all who participated. 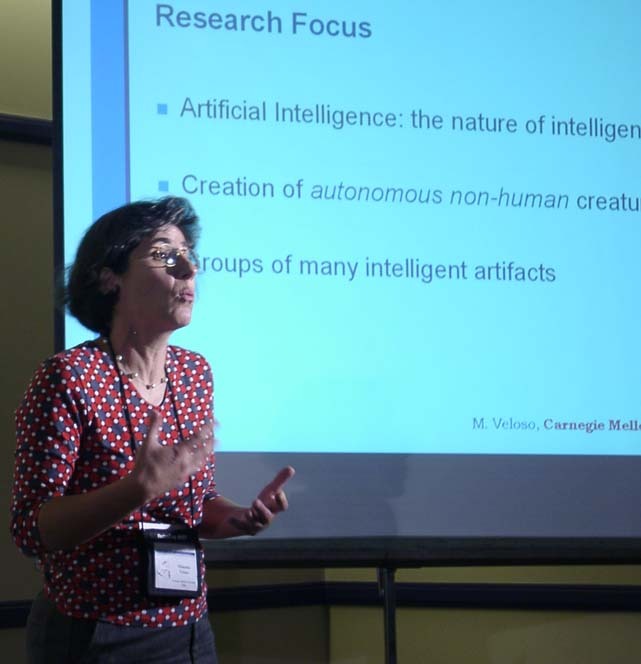 The theme of the conference was "AI and its Benefits to Society." The proceedings of the conference are available online at www.ijcai.org , where you can also find instructions on how to order a hard copy, if interested. 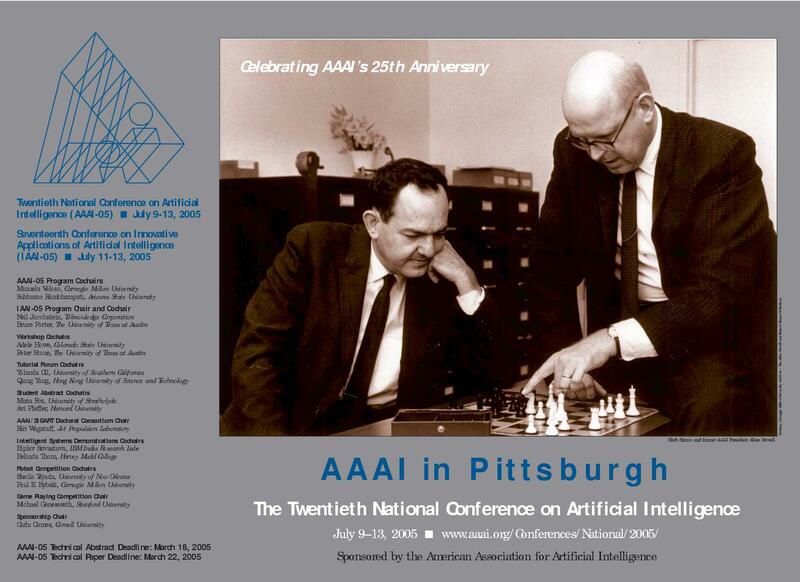 I was program co-chair of AAAI-05, held July 9-13, 2005, in Pittsburgh. RoboCup'01, Seattle, USA, August 2-10, 2001. IJCAI-99 Workshop: The Third International Workshop on RoboCup, Stockholm, July 31 - August 1, 1999. RoboCup'98, La Villette, Paris, July 4-9, 1998. AIPS-98, The Fourth International Conference on AI Planning Systems, June 7-10, 1998, Carnegie Mellon Univerity, Pittsburgh, USA. NSF-CNPq sponsored workshop on "Intelligent Robotic Agents," Porto Alegre, Brazil, March 17-19, 1997. ICML/COLT 1997 Tutorial on "Learning in Planning". Memorial: Mafalda Ferin Cunha, a tribute to my remarkable late sister-in-law (in Portuguese).